I bought this as a Christmas gift for my husband! He LOVES it! I was worried it would look cheap or childish, but it was great! The leather band is nice. The skull in the watch is nice. The whole watch was well made and a great purchase! A skull design is featured on the dial of this Nemesis men's watch. This fine timepiece secures with a black leather strap. The wristband is adorned with silvertone studs and a pin buckle clasp. Case, hands and numerals are silvertone as well. Japanese quartz movements keep precise time, and the watch is water resistant to 99 feet. This watch makes a perfect gift for any man who wants a timepiece with an edge. I purchased this watch as a birthday gift for a friend. The quality and design was beyond my expectations. 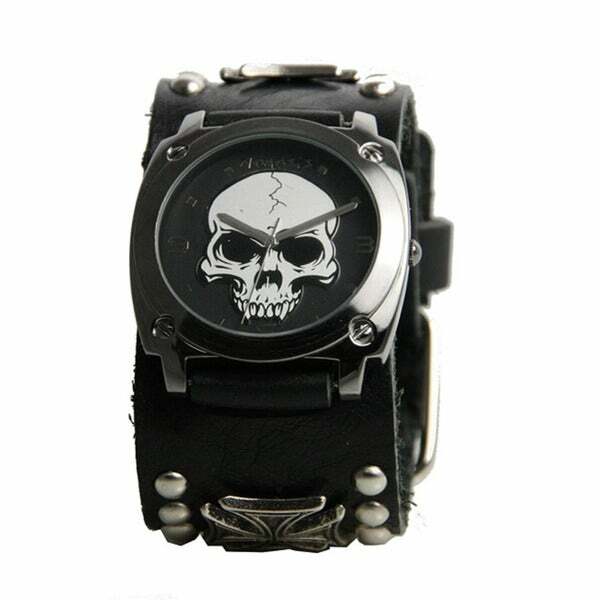 The skull features in the watch face and on the large black leather watch band were definately cool. I used the gift wrapped option for shipping. The watch came securely boxed with safe packing material. Absolutely a recommend this option. This was a gift for my teenage grandson who was overwhelmed by the watch. The face is easy to read and the graphics are clear. It was running when it was received and is still running. It is accurate and easy to set. The watch band is a quality band so I was impressed with this item and will order other Nemesis items if this watch lasts the life of its guarantee. Thanks Overstock for prompt delivery. This is a very clean but wild looking watch, great for a night out clubing or motorcycle ride. The only one thing it is missing, is the watch does not have a light source for night time viewing. It is heavy duty with a very easy to buckle wrist band. I would recomend this one to any friend. This watch is great for the price. My husband who has a metal allergy LOVED it since it has the leather strap underneath the back of the watch. Definitely a great gift. Watch is for a young man 22 years old. Loves skulls, etc. So it will be a well received gift. Bought for my 12 year old nephew who loves skulls. He is pretty skinny I guess so I was told this watch was still too big for him and the only comment I received was the strap is thicker than expected, not sure what that means but just giving the feedback I received. My Husband Love this watch.This my gift to him....Thank you..
Good looking watch at a good price! The watch arrived in great condition; however, it was a bit "dusty". A good cleaning with a duster and all was as good as new! Looking forward to seeing the expression on my husband's face when he opens this gift. He has spent a lot of time looking for inexpensive watches he can wear when he is riding his motorcycle. Good looking watch at a good price! Love it. Price right. Shipped and received on time. Thumbs up. this is the second one I have got and love it. I got this as a gift for my son who is hard to buy for. He absolutely loved it! Very well made and attracts attention. I would reconnect this watch to anyone! The best Christmas gift ever for my son!!! Christmas gift for my 23 year old son!!! He loves it!!!! It is so comfy...He always has it on and I am sooo surprised to see him wearing it all the time!! my friend loves skulls and he really liked the way this watch looks I myself like skulls as well and I have the same watch. "Apart from the price mentioned above , how can we know about the exact prices i.e. after addition of all taxes, duties, shipping etc." Hello bhimthapa, Taxes, Duties, International Service Fee and Shipping will be added during checkout. Please add the item to the cart and enter your postal information for the complete price. Please let us know if you have any further questions. "Does this watch have any crosses on it?" It does have a cross on it. Yes, there is a cross on it.